Nourish Sequim has undergone the Eat REAL Certified Audit and become the first in Washington state to qualify for Platinum level certification. Nourish minimizes their environmental impact through sustainable practices and sources many ingredients from small neighboring farms, to create beautiful, organic dishes meant to highlight the bounty of the Pacific Northwest. This certification incorporates responsible food preparation, sustainable produce sourcing, and a tiered (Silver, Gold, and Platinum) system for scoring restaurants that go above and beyond in their operations. Additionally, Nourish Sequim currently sources all lamb from Certified Humane farms, and chicken from farms certified by Global Animal Partnership (GAP) Step 3 or higher and is further recognized by REAL Certified and the ASPCA Shop With Your Heart program. The highly-coveted REAL certification has been achieved by over 500 restaurant and foodservice providers. Utilizing a points-based audit, third-party registered dieticians evaluate establishments through interviews and menu, supply chain and operations analysis. Those that earn sufficient points in the areas of Responsible (nutrition), Epicurean (preparation), Agricultural (sourcing) and Leadership (going above and beyond) are able to become REAL Certified. Eat REAL is a 501(c) (3) nonprofit dedicated to transforming America’s food system and fighting diet-related disease. 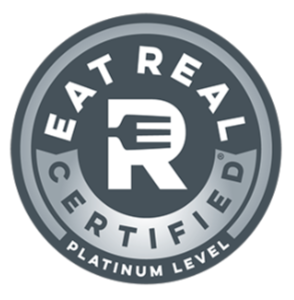 Launched in 2012, Eat REAL Certified is a nutrition and sustainability best practices certification program aimed at realigning the food industry’s incentives with consumers’ health interests. The organization has certified over 500 restaurants, corporate cafes and university and school dining services in 35 states, with financial support from the Tennessee Department of Health, the Park Foundation, the Mary Black Foundation, the Campbell Foundation and the Robert Wood Johnson Foundation President’s Grant Fund of the Princeton Area Community Foundation. More information can be found at www.eatreal.org. Thank you Judith, we are hearing this from a lot of folks – so there is a very good chance it will return. Judith, the lamb burger is back!